ELVIS IS IN THE BUILDING! 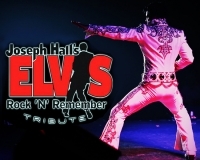 Joseph Hall is thrilled to be bringing his Elvis Rock N Remember tribute show! This show is directed in such a manner that really shows the roots of Elvis but yet a fast pace show that will make it difficult for you to stay in your seat. It caters to both the young and the young at heart. He's got the look, the voice, the charm and the moves that take us back to a time when parents were flabbergasted by the flauntingly provocative hip action. In Hall's Elvis Rock N Remember show, he achieves a powerful flashback experience to the moment when fans fell in love with the talented, handsome, carefree, energetic, high spirited young man that is Elvis Presley. The show is masterfully produced with a mixture of Elvis hits from rock n roll, country, pop to gospel, multiple costume changes and a heartfelt tribute to our veterans. He's even got the teddy bears and scarves to woo the ladies. A must-see for all ages!